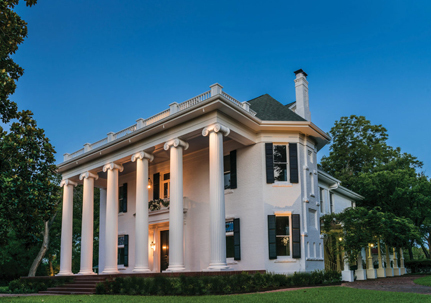 There is no question that Texas is rich with history and tradition, and the story of Round Rock wouldn’t be complete without the details of the Woodbine Mansion. Andrew J. and Hedwig Nelson settled in Round Rock from Sweden and quickly hired renowned architects, the Page Brothers of Austin, to construct a Victorian-style mansion. Many of the materials used in building the mansion came from homes in Austin that were being renovated. Even years later, many of the outside buildings on the grounds have been transformed using columns and doors from a home near the University of Texas campus. Construction began in 1895 and the mansion was completed in 1900, which was largely characterized by its steep roof with many gables and chimneys. Around this time, Round Rock was a booming and prosperous trade center, having just completed a railroad link through town, and was home to many factories where construction materials and home goods were made. In 1931, the mansion was remodeled by a Dallas architect to reflect classical, Greek revival style, which can be seen in its iconic, symmetrical front. This style was something never before seen in Round Rock, adding to its allure as the most well-known historic home in town. 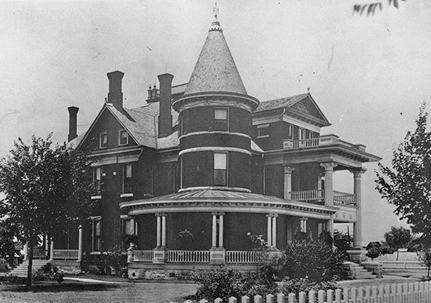 Nearly 30 years after the remodel, Mr. and Mrs. Eugene N. Crier Goodrich purchased the mansion and officially named it Woodbine. The Woodbine Mansion has always been impressive in size, with a widow’s walk on top of the three-story home that presents a view for miles. Some of the original, ornate details inside the mansion remain to be enjoyed by guests. All of the mirrors are original décor – the 10’pier glass mirror in the ballroom dated from the early 19th century was acquired from a New Orleans estate sale while the gold leaf mirrors in the drawing room were imported from Europe. All of the original chandeliers remain in the mansion, many of which reflect period-style décor. In 1973, the Woodbine Mansion was recorded as a Texas Historic Landmark and remains to be a dominant element of Round Rock’s skyline. 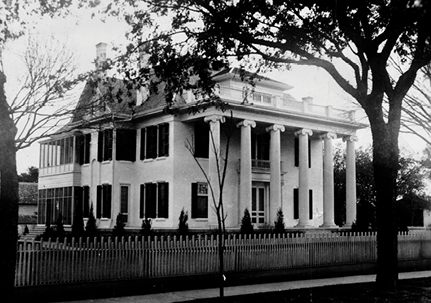 Today, the Woodbine Mansion is situated on its own city block, surrounded by towering Elm, Pecan, and Magnolia trees. Since the Woodbine Mansion made its debut in 1900, it has only been owned by three families. Three generations of Nelsons lived in the home from 1900 to 1960, when it was purchased by the Goodriches. In March 2018, the Woodbine Mansion was purchased by the Levin family. Robert and Olga Levin are collaborating with their daughter, Becky Levin Navarro, who has worked in event planning since 2006. Robert owns a remodeling company that has begun restoring the Woodbine Mansion to its 1931 state. Becky founded Pearl Events Austin in 2010, and has been planning fairytale weddings and custom events ever since. In 2013, she was named Coordinator of the Year by the Nuptial Essentials Association of Wedding Professionals. Led by Becky’s vision for this beautiful, historic estate, she and her family look forward to hosting special occasions and events at the Woodbine Mansion. From the chandeliers to the place settings, they are ready to help you create special memories with your family and friends for years to come.